The Italian government is considering using the army to deal with mafia in Naples who are accused of dumping toxic waste around the city. Soldiers could be deployed "to deal with... the phenomenon of the environment mafia", said Defence Undersecretary Gioacchino Alfano. Police are digging to try to find one particularly toxic cache of waste. Huge excavators are at work at the site on the edge of the town of Casal di Principe, north of Naples, and the search is being conducted by officers in full protective suits and face-masks. Police are working from information given to a judge by two mafia men who switched sides. 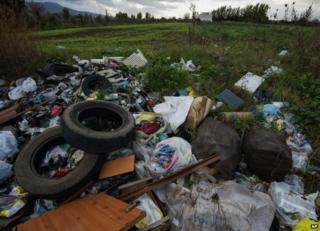 They have told a judge where exactly they believe this dumping operation was carried out - on the edge of the town of Casal di Principe, in the heartland of the formidable local mafia, known as the Camorra. The crime network has been making money for decades by illegally disposing of industrial waste in the area. Local people are increasingly concerned about this kind of pollution, the BBC's Alan Johnston reports. There are fears that underground water supplies might have been contaminated, our correspondent says,. The government is trying to tackle what many now regard as a very serious environmental and public health issue, he adds. Tens of millions of euros have just been set aside to cover the costs of medical examinations for people in a swathe of territory north of Naples. The army has been used twice before in recent times to help clear uncollected waste from Naples - in 2008 and 2011, when they ferried rubbish out of the city in lorries after landfill sites became too full. It was not immediately clear what role the military would play under the new proposal, which would need backing in parliament. However, Mr Alfano is confident of success: "For the first time, all political forces are in agreement to offer concrete solutions to resolve a specific problem." Hidden out of sight down dirt tracks in the countryside are vast mounds of illegal and hazardous waste, from broken sheets of asbestos to car tyres and containers of industrial-strength glue, AFP news agency reports. Periodically set alight, they billow black fumes towards neighbouring towns but locals say the real killer lies in aquifers feeding tomato, cabbage and broccoli crops which are poisoned with chloroform, arsenic and heavy metals. So common has the phenomenon become that the area between Naples and Caserta has been nicknamed the "Land of Fires". According to environmental protection association Legambiente, 10m tonnes of industrial waste were burnt or buried in the zone between 1991 and 2013, all trucked in at night. Toxic waste has been buried in the area for decades, ever since the Camorra branched into the lucrative waste disposal business in the 1980s. Companies paid criminals a fraction of the cost of official waste firms to dump the waste in fields, wells and lakes.